These are the 'finished' projects. 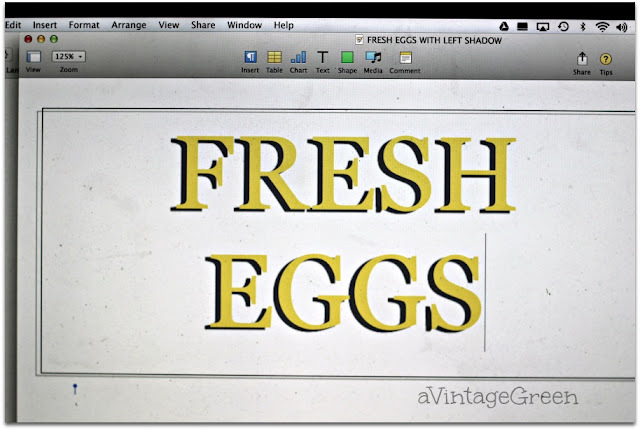 I bought two fine tipped artist brushes for better line control when painting shadows on the edges of stencilled letters and made myself a text picture for left shadows to use as my shadow guide. This framed piece of plywood was a July thrift store 1/2 price day sale, it sat around waiting for something extra. 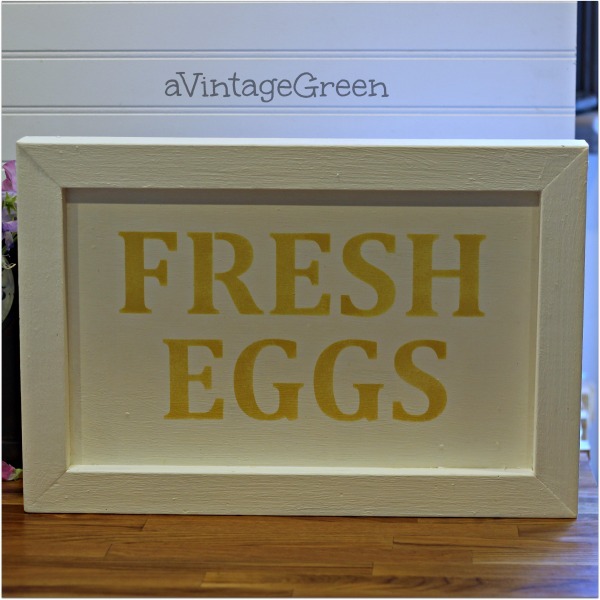 I thought about a chalkboard but this week decided to make a (another) Fresh Eggs sign. 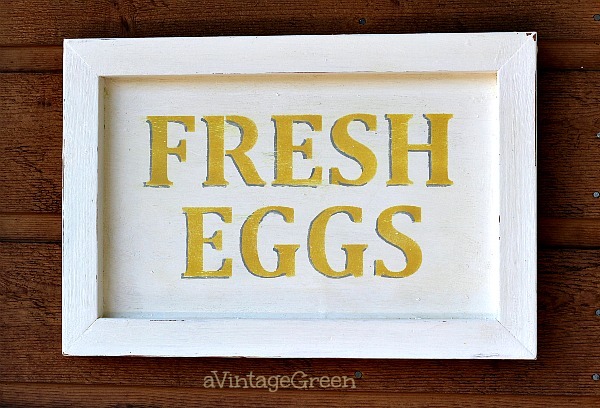 Here are my previous Fresh Egg signs here, here, here, here. You can see my practice shadow lining below on the paper behind the sign. The basic sign turned out the way I planned. Worked carefully and slowly adding shadow lines on the left of each letter, using the text picture as a guide. It is much easier to make shadows on paper than it is on plywood. 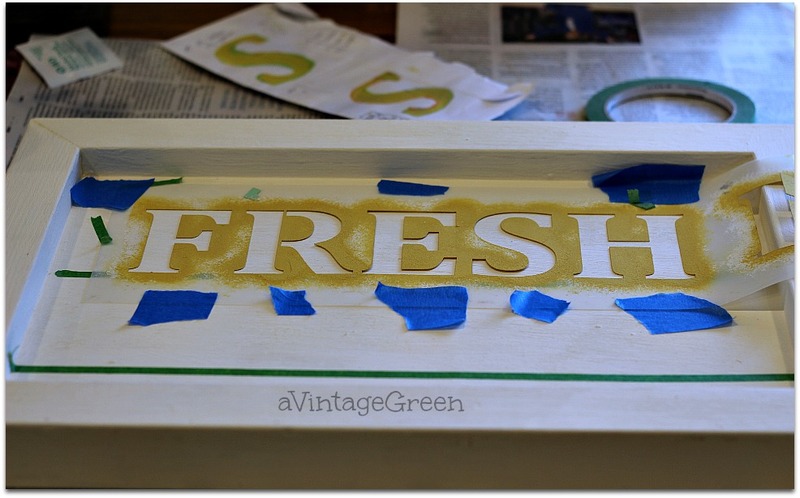 Next step was sanding the letters - a good way to correct any over painting mistakes. 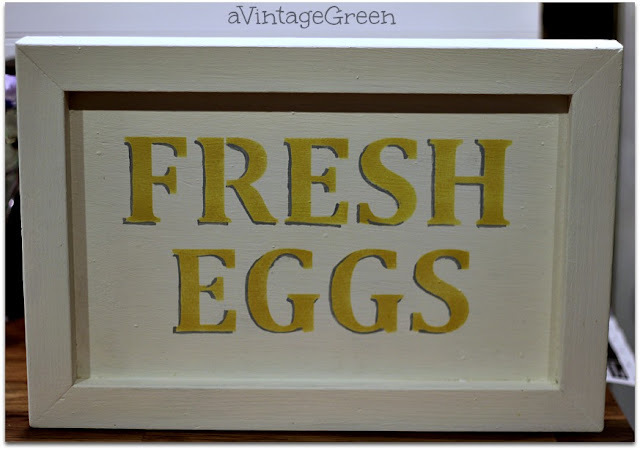 I sanded a few edges of the sign as well. Clear waxed and polished. The key shaped key holder was found at the same thrift sale and was freshened with some CeCe Caldwell Simply White, a bit of sanding, stencil of 3 keys, used CeCe Caldwell Pittsberg Gray and finished with clear wax, polished and replaced the 4 cup hooks. Two pieces of wood are now ready for new homes. 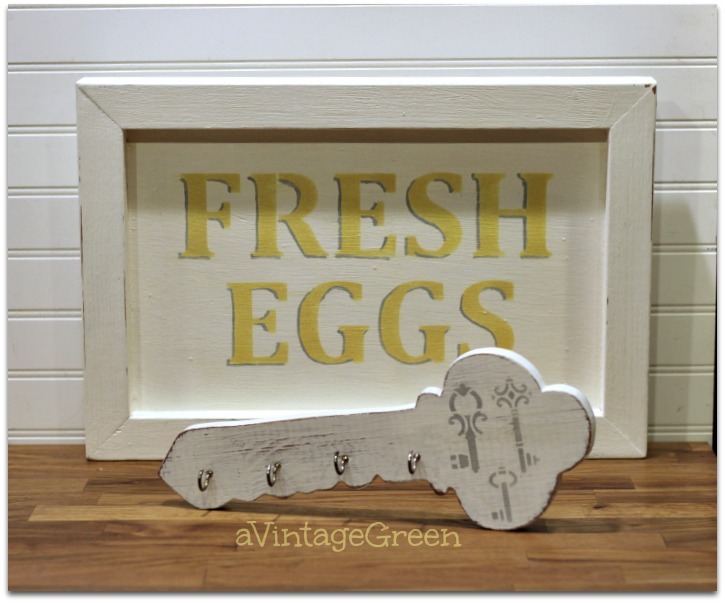 Really sweet sign and key holder. 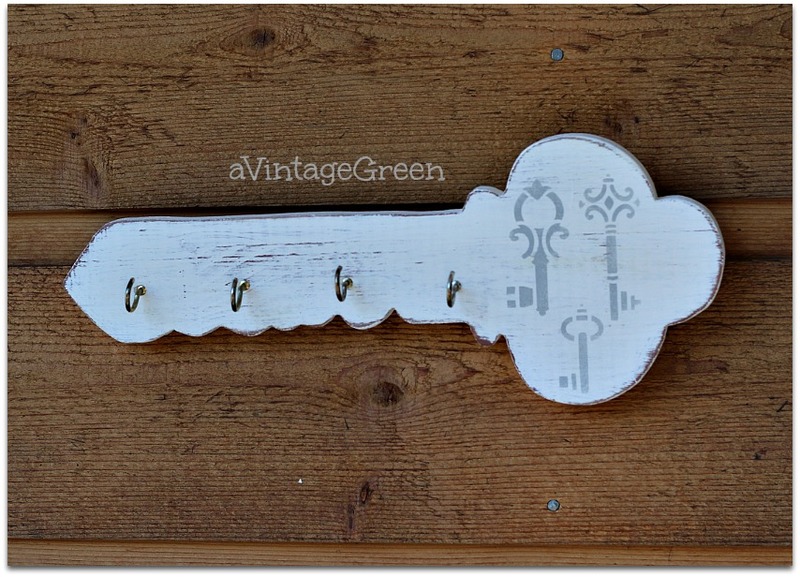 Love the key stencil. Lovely! You did an amazing job, Joy! Thanks for sharing at Funatastic Friday/twochicksandamom:). Joy you really do the best stenciling! These both look amazing, Joy! You made it look easy. I've always wanted to try this but just never have. Love your new projects, Joy. Thank you for sharing @Vintage Charm--pinned! Doing a little visiting this evening and feeling so inspired by your talent and projects. 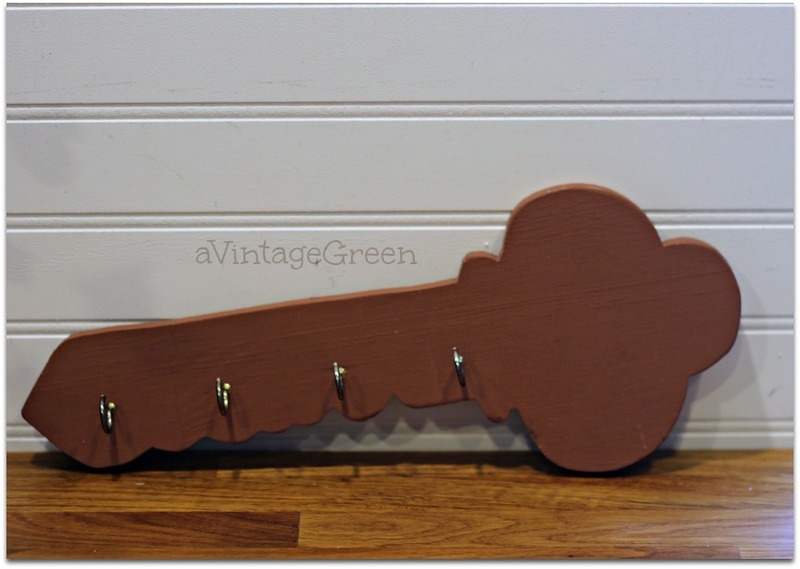 Such a darling sign and key holder. Joy, both are adorable!! I have always wanted to try painting letters and outlinind them but never dared to try, thanks for the tips! I am featuring it at this week's party, congratulations!! Enjoy your weekend! Very fun Joy…love the yellow--so refreshing!!! You are so tricky and amazing! I really admire your projects because I never in a million years could paint so neatly and cleanly. I am going to try one day, though, using you as inspiration, especially the idea of sanding over mistakes and using stencils as a template. I'm hoping to find a really inexpensive object at a yard sale to practice on--then it won't be a disaster if it doesn't turn out. 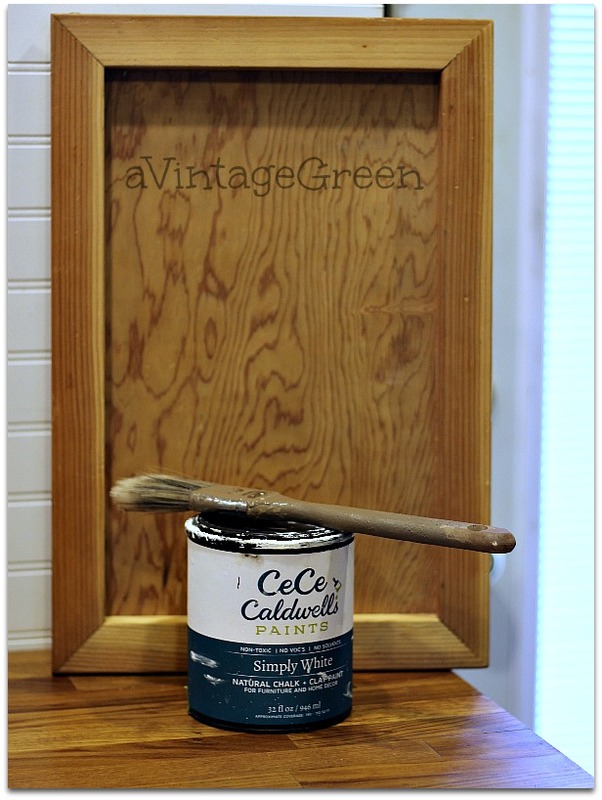 Better yet, I'll have my husband or daughter, who paint much more neatly, do the hard parts. I love seeing what you do. Nice job, Joy! I especially like the 'egg' sign, it turned out nice!